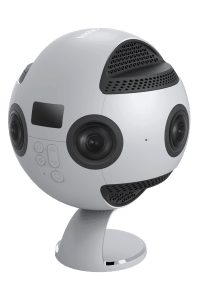 The Insta360 Pro is the “affordable” professional 360 camera created by the same team who designed the Insta360 Nano and the Insta360 Air. Compared to their previous products, the Pro is a far more powerful camera and is set to be the lowest price professional 360 camera ever. I’m about to tell you everything you need to know about the Insta360 Pro including specifications, example videos, release date and where you can buy it. The Insta360 Pro is classified as a “professional” 360 camera, that means it is aimed at those who are looking to shoot very high quality 360 video. The price of this camera is therefore out of range for most people who just want a 360 camera to film their vacations (click here to see a full list of consumer level 360 cameras), but for those who want to take their 360 videos up a notch, the Insta360 Pro is now the most cost effective way to do so. The Insta360 Pro has an extremely impressive set of specifications. This is a 360 camera that can shoot in 8K video resolution, create 3D video, shoot in slow motion and livestream in 360 degrees. This is just about everything a film maker who wants to shoot in 360 degrees could ask for. 360 photos and videos are both shot at 8K resolution, which is more than double the resolution of most cheaper 360 cameras. This huge resolution is extremely important to ensure sharp, high quality 360 footage. 4K is considered the minimum for decent 360 video when viewed on social media, however 8K is required for high quality, VR ready 360 video. 8K video is restricted to post processing stitching, which means it will stitch the video together after you have shot the footage rather than as the footage is being recorded. Slow motion 360 video is shot at 100fps at a resolution of 4K. This is a feature not seen in any 360 camera so far and I’m really looking forward to seeing the combination of 360 and slow motion. I think this will be a must have feature of 360 cameras in the future. Live streaming in 360 degrees is becoming a very popular feature, both Facebook and YouTube enable 360 live streaming however most 360 cameras can only do so at very low resolutions. The Insta360 Pro can live stream in 4K, which is more than good enough for social media and will result in clear footage. Make sure you have a goo internet connection though, as streaming such high quality video will be tough if you have a poor connection. The Pro is also able to connect via 4G or Ethernet, so you have plenty of internet connection options if WiFi isn’t working for you. As with all Insta360 cameras, the Insta360 Pro has built in stabilization which keeps your 360 video looking smooth. This is very important for all video, but especially 360 video which can be very difficult to watch if there is too much vibration or shakiness. The Insta360 Pro is powered by a removable battery which will last around an hour of continuous shooting. You can always purchase backups and swap out the batteries if you want to shoot for longer, or you can plug your camera into the mains power supply and have it running for as long as you need. The Pro is fitted with internal fans so it can be always on and not overheat. 6 fish eye lenses can shoot at an aperture of 2.4, which is about standard for most 360 cameras, and there will also be a variety of manual controls available when the camera is connected to the official app of desktop software. The Insta360 Pro seems to have all the bells and whistles that a 360 film maker could ask for, but the question remains as to whether it can actually create the amazing 360 footage it promises. Sometimes having too many features can lead to a lowering of overall quality and software if just as important as hardware, but difficult to judge until you’ve seen it in action. Thankfully Insta360 have released test footage from the Pro so we can get a taste of what the camera can do. One of the best value 8K 360 cameras. Packed with features. Here are three example 360 photos from the Insta360 Pro, one shot in daylight, the other at dusk and the final one at night. Remember that the Insta360 Pro can shoot 60 megapixel images and has an aperture of f/2.4. What we are looking for is crystal clear images with minimal blurriness and accurate stitching. Taken at the height of day with full sunlight, this is the best environment in which to take a 360 photo. The image here is absolutely crystal clear, with minute details visible in the trees and leaves. Stitching is the best I’ve seen of any 360 camera and even objects close to the camera are not effected by the stitching. This dusk shot is another beautiful example of what the Insta360 Pro can do. Again the image is sharp with no blurriness that often accompanies lower resolution 360 photos. Looking at the clarity of the individual drops of water really shows the 60 megapixels at work. Low light has been a consistent issue for 360 photography and no camera does it well. The Insta360 Pro can clearly shoot excellent quality 360 photos but as you can see in this photo there is some blurriness in this night time shot, never the less this is still the best night time 360 image I’ve seen and you’ll struggle to do better without spending thousands more. The quality of these 360 photos is exceptional and far beyond anything a consumer level 360 camera could produce. Remember the Pro can also shoot 3D 360 photos which are not shown here. This is an 8K video shot with the Insta360 Pro, however when a 360 video is uploaded to YouTube some the quality is reduced, so you won’t be viewing the video at its absolute best. Still, you should be able to get a pretty good idea of the video quality from this clip. Pretty impressive, no? This video seems to indicate that the Insta360 Pro does live up to its promise to create crystal clear 360 video. The stand out feature of this camera has got to be the super accurate stitching, which is almost invisible in this video. The clarity of the video is also suburb and could easily match up to a DSLR. This is the level of quality required for 360 video to look good on a VR headset. Compared to the few other professional 360 cameras out at the moment, the specs of the Insta360 Pro represent huge value for money. The Nokia Ozo can also shoot excellent quality 360 footage, but at a cost of $30,000 it’s nearly 10x more expensive. Another similarly priced 360 camera is the Orah 4i, which is actually slightly cheaper at $3000, however it can only shoot a maximum of 4K resolution. I think its safe to say that this is the stand out 360 camera of the year for anyone looking to shoot high quality 360 video for VR. As you can probably tell from my gushing in this post, I’m very excited about the Insta360 Pro. I truly think this camera is a revolutionary step up in terms of quality, features and price. I’m particularly excited about slow motion in 360 degrees as I think it will give people time to look around a 360 video and really take it in. The 8K video is stunning as are the photos we’ve seen so far. Whilst there are camera out there that can outmatch the Pro, you have to pay triple or even more for just a slight boost in quality. I met up with the marketing team from Insta360 who showed me the camera and what it can do, I also got a chance to look at the footage on a VR headset and I was stunned at how clear it was! 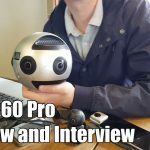 The guys from Insta360 explained to me that they wanted to create a professional 360 camera that was cheap enough to buy outright for smaller creators. Up to now the best option has been to hire a $40,000 camera for a few days or a week, but this could end up being the same cost as buying an Insta360 Pro outright. Currently experimenting with one of these cams for an upcoming shoot, and I just wondered if you had any recommendations for the image parameters (sharpness etc)? Usually I’d keep these as low as possible in camera, but my tests so far seem s a little muddy..